Hi friends. Mother’s Day in the US is only a couple weeks away, so I’m sharing a pretty card that would make any Mom smile. It features some of my favorite dies from Cheery Lynn Designs and gorgeous ribbon and embellishments from Really Reasonable Ribbon. I created my background paper with Distress Oxide inks. I cut the Lattice 2 die on Stick It Adhesive backed white cardstock and adhered it to the top third of the card. Under that I added the Sweetheart edger lace and I topped it with some 3/8″ Delphinium Double-faced Satin Ribbon to hide the seam where it all joins. I printed my digital sentiment and cut it using the Oval dies and then matted using more of the oval dies. I created some additional layers and it’s then all assembled on a 4-1/4″ x 5-1/2″ card base. My pretty roses were made with the tea rose dies in small and medium. 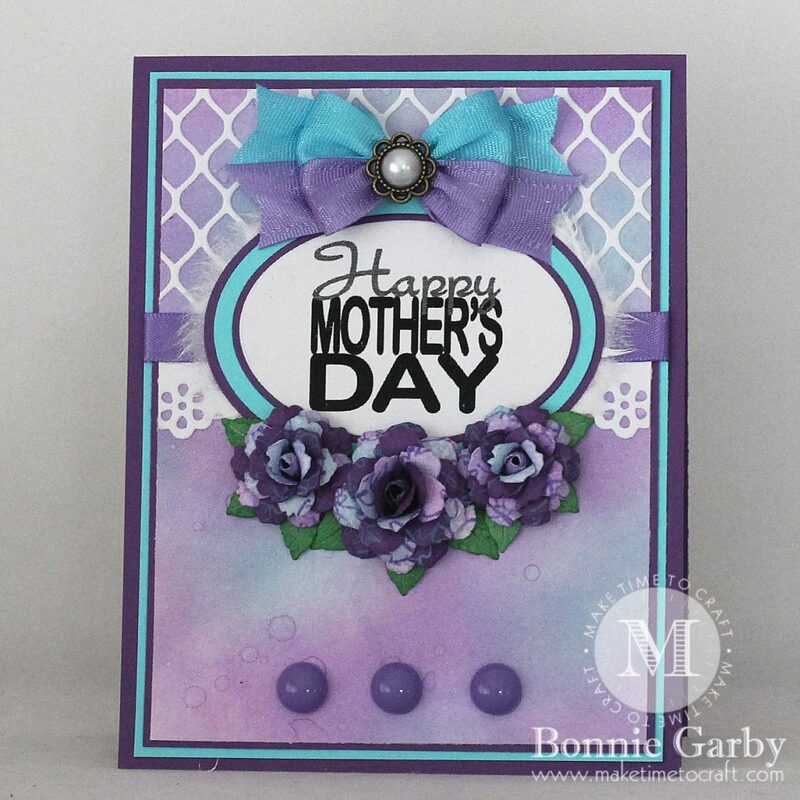 I used alternating layers of dark purple cardstock and leftover Distress Oxide background paper. 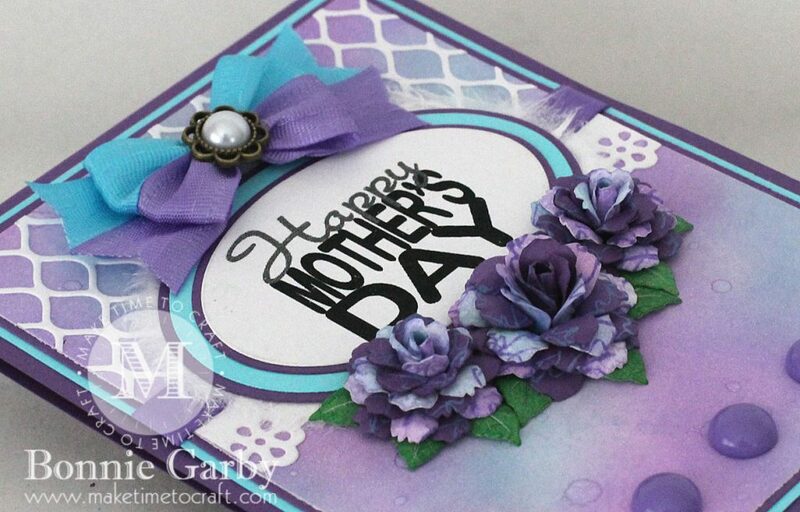 I added some interest by stamping the petal layers with an old script background stamp. I shaped the petals with a stylus and foam pad before assembling the flowers. Once done they were added to my card under the sentiment panel. My card was finished off with a pretty bi-color bow made on my Bow-it-All V3.0 Tool using 5/8″ Delphinium and Turquoise Delicate Stitched Satin Ribbon from Really Reasonable Ribbon. I topped the bow off with a pretty 14mm White flower pearl embellishment. I’ve also added three purple 10mm Round Flatback Resin pieces to the bottom of the card. For a video tutorial on how to create this pretty bi-color bow, please click HERE. I love the background created with distress inks–so soft and pretty! The lattice contrasts beautifully! 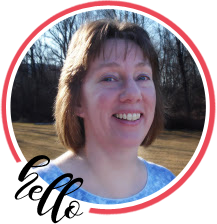 So glad you joined the challenge at Jo’s Scrap Shack this week. Beautiful. Thanks for sharing at Pause Dream Enjoy Linky Party. 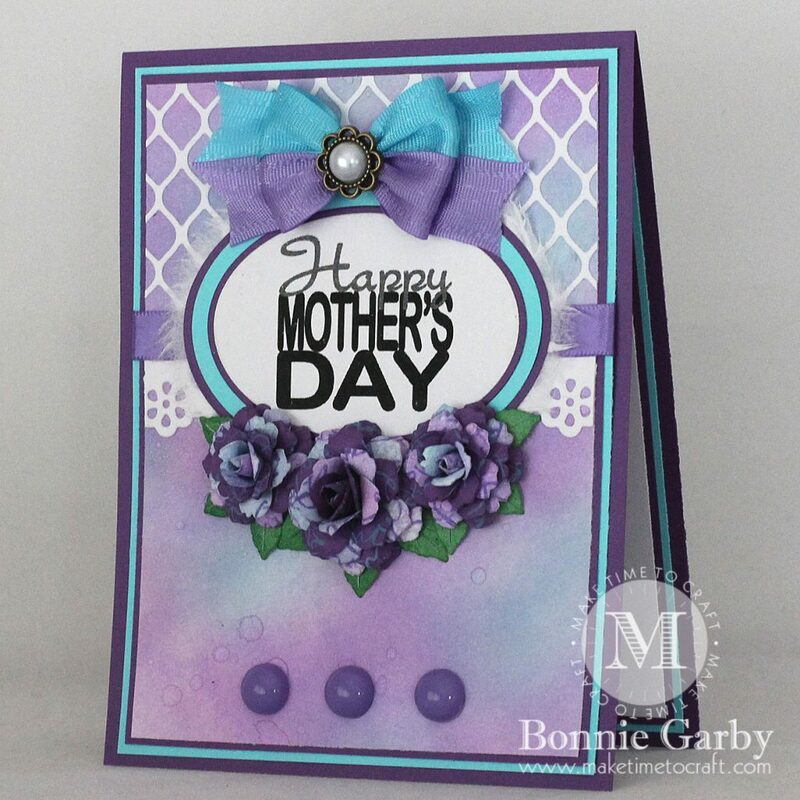 Love the beautiful rich color tones you used on this card! Thanks so much for joining us at Color Throwdown! Beautiful card. I always love seeing what you create. You really have a great eye for colors and design and those bows you create.. Your mom will love this card. Oh wow this card is stunning!!!! Bonnie the colors together are so striking and beautiful!! I have always loved purple and teal together! Your bow is so beautiful!! Love this beautiful sentiment and your background is gorgeous! I can see the blend of the colors! Nice! Gorgeous flowers too, as always. Another gorgeous creation my friend!!! Thank you so much for joining in with us this week at Jo’s Funday Friday challenges! This is gorgeous – I love the two tone roses! What a fabulous creation indeed! A beautiful card, love the colours and love those flowers. Thank you for joining our Anything Goes challenge over at MMC. We hope to see you again soon. FANTASTIC Bonnie! My favorite color combo and OMG those roses are gorgeous!!! Another beautiful & inspiring creation! Thanks so much for playing in our ‘Flowers’ challenge at Dies R Us! Please come back again soon! Absolutely beautiful! Amazing color scheme and fabulous design! I love the layering and the pretty bow and flowers! Love this! Perfection in ink blending and such a gorgeous card! Thanks so much for joining us at CCCB! 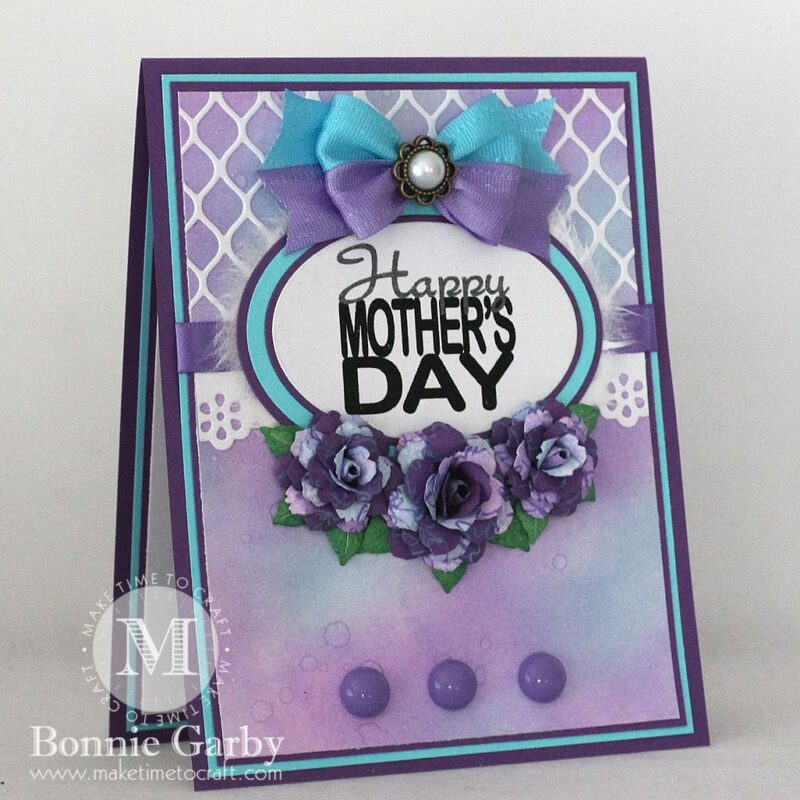 A beautiful Mother’s Day card, gorgeous colours. Such a beautiful card! The bow is perfect 🙂 Thank you for participating in our challenge from Dies R Us! This is so pretty and I think the shades of lavender are gorgeous! Thanks for joining us at Making Memories Crafting and I hope you’ll be back again soon. Thank you for sharing on CWAA and I hope you join us next month. Good luck, I keep my fingers crossed.